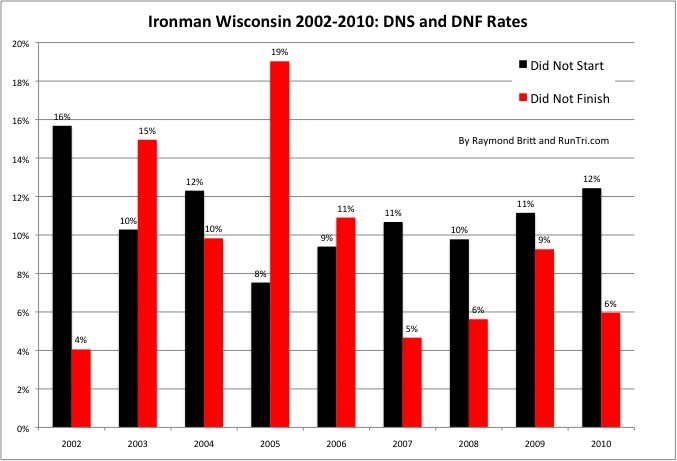 I've competed in five Ironman Wisconsins, from cool days to scorchers, from a low of 4% in the inaugural year (though 16% registered but did not start) to 19% in 2005. Competitors in 2003 and 2005 were faced with 90-100 degree conditions; 2006 was a freezing, rainy, awful day, while 2008 and 2009 were perfect. In recent years, the race norm seems to be a 10% to 12% DNS rate and a 5% to 6% DNF rate, which is reflected in our RunTri's Toughest 25 Ironman Triathlon analysis. Even in perfect conditions, Ironman Wisconsin rates a top 5 Most Difficult races rating.